"Peanut-free! 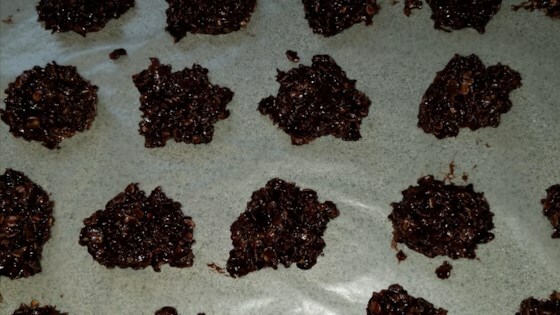 These no-bake chocolate macaroons are also known as 'Frogs and Haystacks.' My mother has been making these since before I was born; she passed this down to me. There are many no-bake cookies out there, but I like these best. Store in an airtight container in a cool spot. These can be frozen." Stir oats, cocoa powder, and coconut together in a large bowl. Whisk sugar, milk, and butter together in a nonstick pot; bring to a boil and cook, stirring constantly, until sugar is completely dissolved, about 2 minutes. Remove from heat and stir vanilla extract into butter mixture. Stir oat mixture into butter mixture until well-combined. Drop mixture by the spoonful onto waxed paper and let sit until set, at least 15 minutes. See how to make little meringue sandwiches with a ganache filling. Lay out your waxed paper beforehand; these cookies come together very quickly! You will want to get them portioned out fast before they set-up. I use a 1 tablespoon cookie scoop, and it goes quickly. Love this recipe! Worked out perfect for my little Easter treat! Easter Egg Nests!! They were ready in less than 25 minutes. While this recipe is tasty, the resulting cookies never firm up. After refrigerating them overnight, they were still unable to hold shape. Made according to directions. Did not set up and were not very flavorful. Will not make again.